This project is a rebirth of the classic LiveXP project. 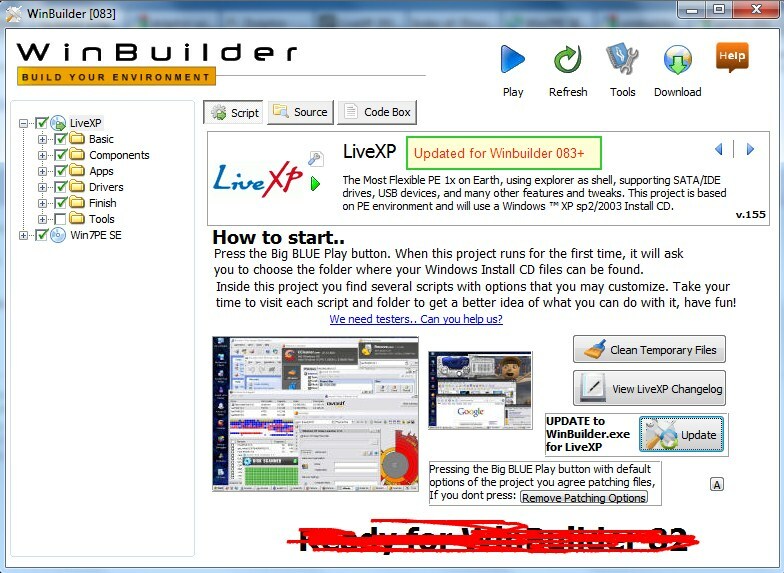 The classic LiveXP projects runs only on WinBuilder versions 77 RC 2 and 80 Rev 3. The adapted project runs also on WinBuilder versions 82 and later. One of the advantages of LiveXP 2012 is the build speed. The build under 82 needs only 40% of the time of the 080 build. No changes with script selections / options have been done. Thanks! Will be downloading. Can go wrong with faster build. Thank you! I'm new to WinBuilder, so far I only made one "Win7 PE SE 20120107" build. Around that time, I also tried an XP build, but it didn't work. As far I can see right now, it might have had something to do with a compatibility issue between LiveXP and the WinBuilder version I used? (As you described in your current LiveXP 2012 version). Anyway: This version works beautifully!!! so thank you very much!!! FileCopy - Failed to copy [%BaseDir%\Temp\LiveXP\Lsi_Logic_Driver_Copy\symmpi.sys] to: [%BaseDir%\Target\LiveXP\I386\System32\Drivers\symmpi.sys]: The system cannot find the file specified. My primary intention here is to reanimate LiveXP for WinBuilder 82. As long as I'm optimizing the result, I do not try to fix issues of individual scripts. But I check whether the issue is perhaps introduced by the 82 version. Here: The Webget - issue is a broken link. The FileCopy issue I do not have on my system. Maybe a question of source CD. Let's check later. EDIT: The FileCopy issue depends on a download issue in the Lsi Logic Driver script. The *.zip files seem to be *.html files. Currently I do not have the time to solve that. Edited by pscEx, 07 April 2012 - 05:21 PM. and applied your script, "Thank You Very Much Peter"
Just PM me before board goes down. Thanks Again to Everybody involved. In the build the iso was created and seemed to bootup. I dont know what script is causing the Webget error. The FileCopy file it mentions. Is is necessary for something. If so. How can it be added. Removed use of %variables% as macro. This avoids corresponding warnings. Fixed broken URL in JKDefrag.script. The new server is not yet up and running, just the inbetween replacement. All posts done since Friday will selfdestruct, once the new server goes live! Posts are only lost when the title of window says offline. We will do another db copy before the final transfer. The new build built with no errors. 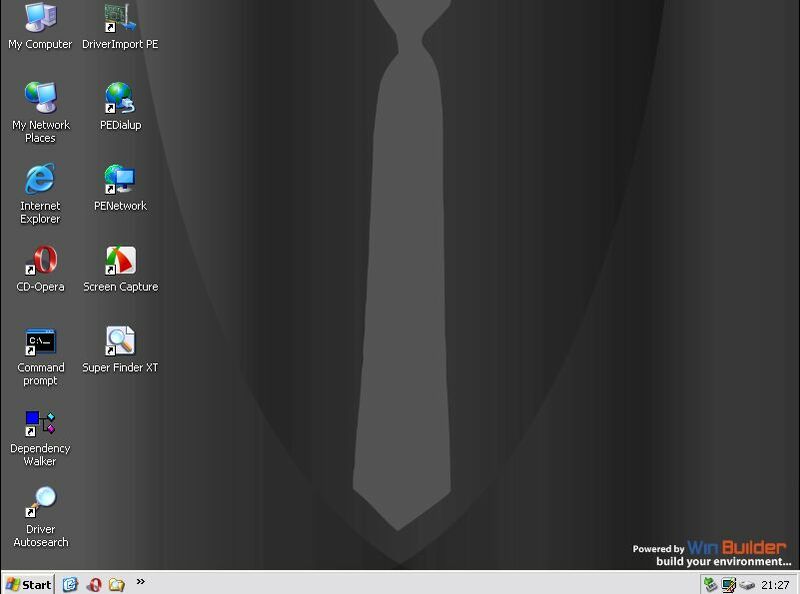 Its so far THE BEST LIVE XP PROJECT....without any errors ,everything worked as smooth and sweet as butter and honey...!!! Sometimes some developer needs some recognition. I have tried Yours perfect project, Winbuilder can really build it very fast. How complex would be to add NVDA support also to this project? I have tried to use sound drivers and i have tried to start NVDA from USB stick, but it can not work. 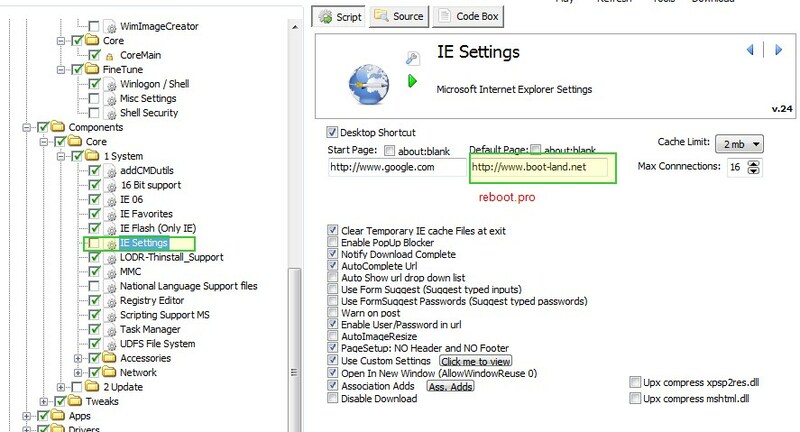 Newest MULTIPE live .iso image can not work with Toshiba notebook, some think is crashing. So my onlyone chance is to modiffi Live XP 155 project to support sound and NVDA. My most complex task is to force live PE to run NVDA automatically at startup. There is strange issue related to memory allocation. Peter, do You think, that You would at this? This project is supporting SATA hard disks reliably, even new USB chips. Amalux live XP can not work for me, because there is some issues with detection of USB chip on The Toshiba satellite notebook, so USB audio sound cart can not work. I think, that it would be very nice to have one Live XP project, which would support NVDA fully automatically, for now, it would require only to copy drivers folder with USB audio related Windows Xp driver files. Any help will be strongly welcomed.